We gave ourselves two weeks to build a feature-rich MVP for the VC community. Here’s how we did it. 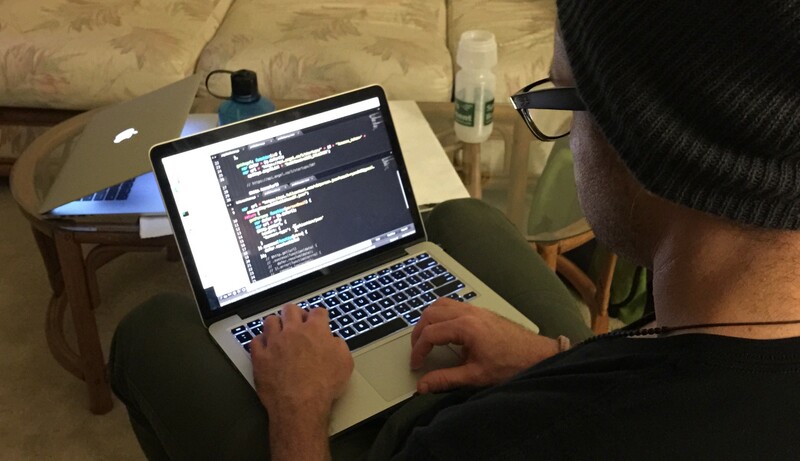 My roommate and I are super passionate about startups and enjoy building software. We wanted a project to build together. This post chronicles our journey. Why build an app within only two weeks? Simple, building software with external constraints, like time (or money), forces the maker to focus on which features are the most important. Without the luxury of time, we had to stay lean, determined, and focused on our only KPI: ship product. Just like how a struggling grapevine produces better wine, so too does a project with some struggle. With that said, Ryan Haase and I now understand what Reid Hoffman meant when he said you should be embarrassed by your minimal viable product (MVP). I even hesitate to write this post at the thought of such embarrassment. But none of that matters now, it’s time to put it in the wild. Let’s back up for a bit. About 16 months ago I started my job as an Entrepreneur-in-Residence at Maven Ventures — a leading VC firm for consumer startups led by Jim Scheinman. While there, part of my role was to help manage our pipeline. We had to keep track of which startups we met with, who were the founders, how the meeting went, did we invest or pass. The list goes on. At first, I managed this process with a spreadsheet. This worked fine up to a point. After a while it became apparent that this solution couldn’t scale. Spreadsheets are static solutions — I quickly lost track of my notes and it was hard to connect founders to startups. Sure these solutions work… but are they optimal? Do they scale? You know what this looks like? This looks like a bunch of really smart investors who couldn’t find a solution that fit their needs so they cleverly hacked one together instead. That brings us to today. Although I no longer work in venture, I figured building a project like this would be fun. I enlisted my roommate, Ryan Haase, to help architect and code this solution. We call it Venture Route and this is our story. 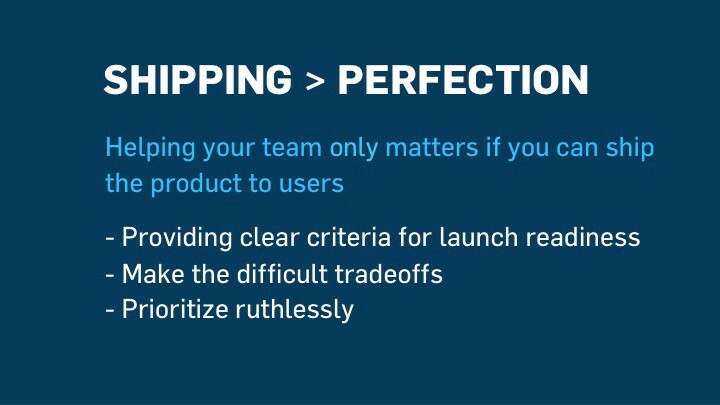 For starters, both Ryan and I believe that a shipped product is better than a perfect product. Done is better than perfect, ruthless prioritization is how teams win. Narrowing down this list was hard, but necessary. For example, take a look at our mockups below. You’ll see that it represents the absolute minimum needed. On the left & right we have the startup and founder profile page mockups , in the center is the dashboard mockup. start with a very narrow product that nails something simple but powerful. And then go from there. 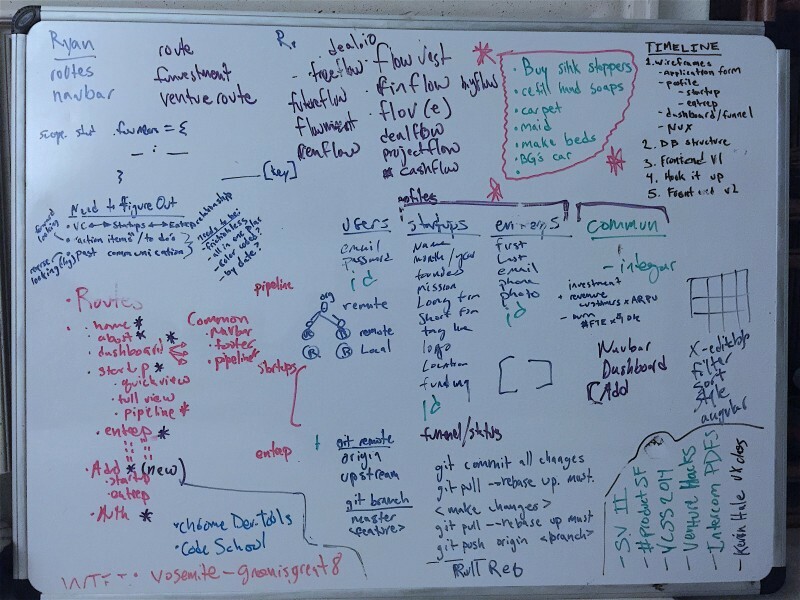 For the period of two weeks, our entire lives were run by the mockups and our whiteboard. We mapped out every step — whether it was the best data structure to store our startups and founders to the order in which we designed and coded our app. Proper planning and roadmapping saved us so much time in the long run. If it didn’t make it on the whiteboard, it didn’t make it into our app. Finally, the best part of this post… time to show you the product! We named it Venture Route. Let’s jump right in. In the navbar at the top, we included an “Add Entry” button for the investor to add a new startup or founder. We made this button conspicuous and ubiquitous for a reason — our app’s success is judged by the number of entries added per firm. Notice that the only required fields are startup name and founder name. All other fields are optional because we want to guide our users through the funnel with as little friction as possible. We want to make it as easy as possible to add a new startup or founder. Upon clicking submit, the user is redirected to the newly entered startup or founder. Remember I mentioned above that only the startup name is required? This is partly because we didn’t want to distract our users with too many fields. Here is another reason: we added a “Get AngelList” button to help fill in many of the form fields. Naval Ravikant and the AngelList team have built an awesome API for the startup community, why not jump at the opportunity to use it? I absolutely love the following feature. Because their API requires you to know the AngelList startup ID in order to capture the correct data, we decided to make two API calls. The first queries their database by startup name. We then pull back six logos to choose from. Upon clicking the correct logo, we query the API for that specific startup via the startup ID. It was a blast implementing this feature. Check it out! Simply click “Get AngelList” and we’ll hit their API for more startup profile info. Thus far, the investor has entered the startup name, the founder name, and has retrieved AngelList data. Super cool. But what if the investor wants more information on the founder? No problem, we got that covered too! The investor will first navigate to the founder’s profile page. This is where we added a “Get Profile” button. Clicking this button will pull in all the founder’s information (contact, social, bio, career, etc), thanks in part to FullContact’s API. Lastly but certainly not least… the dashboard! Here is where we provide the investor with a snapshot of the firm’s pipeline. At the top of the dashboard you’ll see a startup funnel (remember, it’s only an MVP 😉) of how many companies they have at each stage in the pipeline. This is important because it helps identify where there might be bottlenecks or it can act as a pulse of the firm’s current deal volume. Just below the pipeline, we built two tables that display all the startups and founders, sorted by most recently contacted. We sorted by last contact date because it seems 80% of a firm’s attention is focused on hottest 20% of deals. Thus, let’s make it easy for the firm to find the most relevant information quickly. Simply click the pipeline step, make your change, and update! Add a note to a startup or founder without having to navigate away from the dashboard. Unfortunately though, we didn’t have the opportunity to build out this feature as much as we would have liked. There is so much untapped potential here. More to come for sure. And there it is folks… our 14-day MVP! I’m so excited to build the next version of Venture Route. As you may guess, there were tons of features we didn’t include in our MVP. As mentioned, we’d like to rebuild our notes section. Many of the notes are actually conversations that build on top of each other and our current system is too static. Secondly, we’d like to add features that are ‘push’ in nature rather than ‘pull’. For example, instead of the investor having to email each startup requesting a monthly update, wouldn’t it be nice if the investor could sign into Venture Route and see the update immediately? Lastly, we have some clever ideas for partner collaboration. We want to improve the way investors communicate and collaborate with each other. That’s all for now. Please email me with your feedback (below) or tweet this post! ps. thank you Rob Rav for your brutally honest feedback, James Basnett for the awesome logo, Benji Hyam for continued support and encouragement, and Chad Grills for your edits and enthusiasm. This post was written by Benjamin Hoffman and edited by Ryan Haase. Both are passionate about startups and love working in fast-pace, collaborative environments. If you’d like to chat further about our story, find me on twitter at https://twitter.com/benhoffman_. If you’ve read this far, show us some love by clicking the ❤ below.